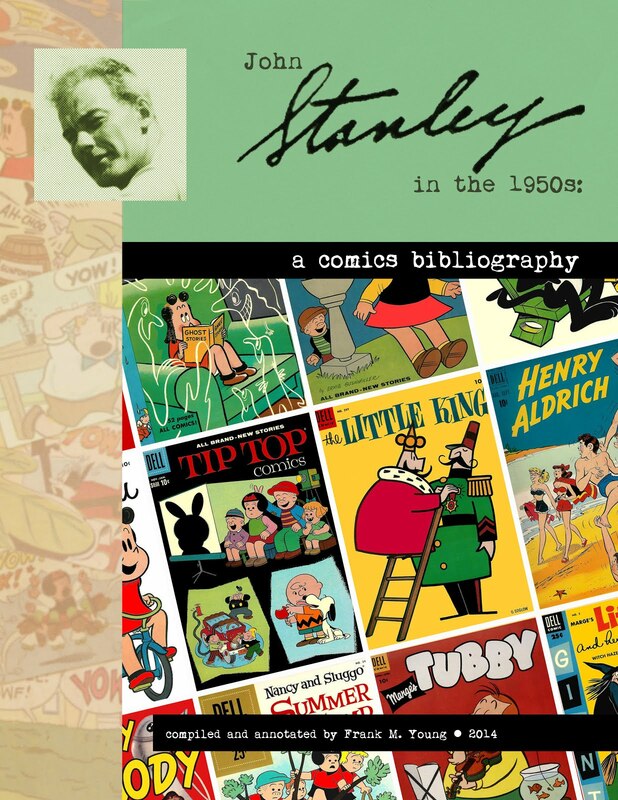 The John Stanley Comics Bibliographies: Don't Forget About 'em! 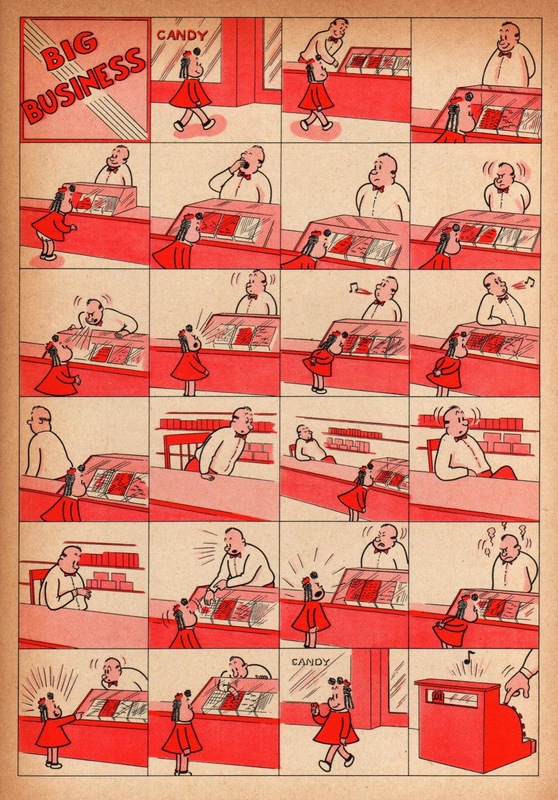 Just a reminder that Frank M. Young has just published a three volume bibliography of the comics work of John Stanley, the mastermind of Dell Comics' Little Lulu series from 1945 to 1959. These volumes offer a total of 470 pages of information and images. Based on years of research, these three volumes purport to chronicle every comic book story John Stanley wrote (and sometimes drew). The cover of every comic book listed is reproduced in color, as are sample pages from stories, in-house ads and original art. Click on each image to enlarge it. Each book is 8 x 10 inches, professionally printed and bound in matte-finish softcover. Each book offers bonus materials. 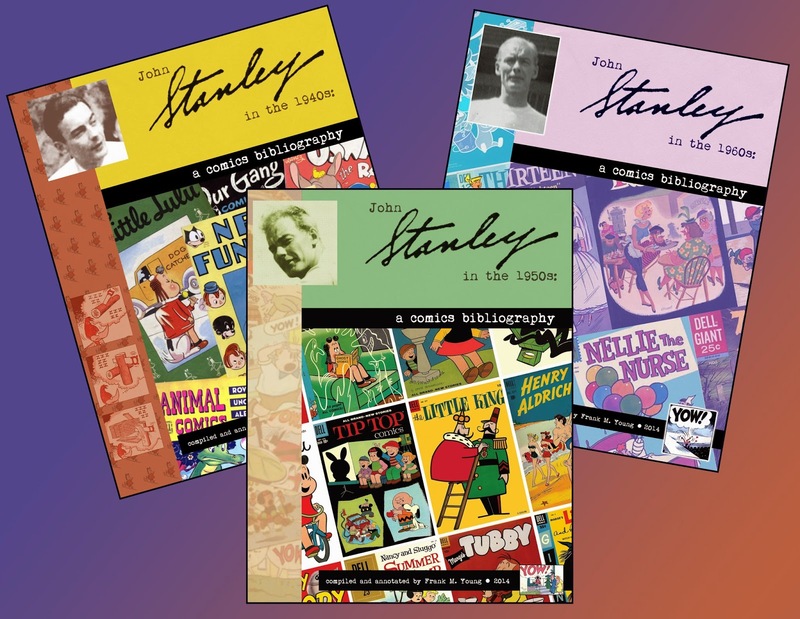 The 1940s and '60s books contain a selection of rare John Stanley stories--none of them ever presented here on Stanley Stories. 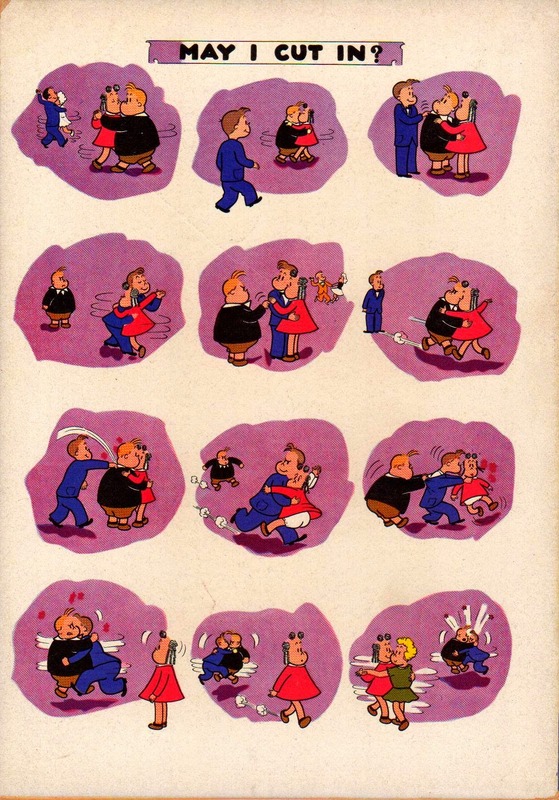 Large images of Stanley's distinctive cover drawings grace the 1940s and 1950s books. 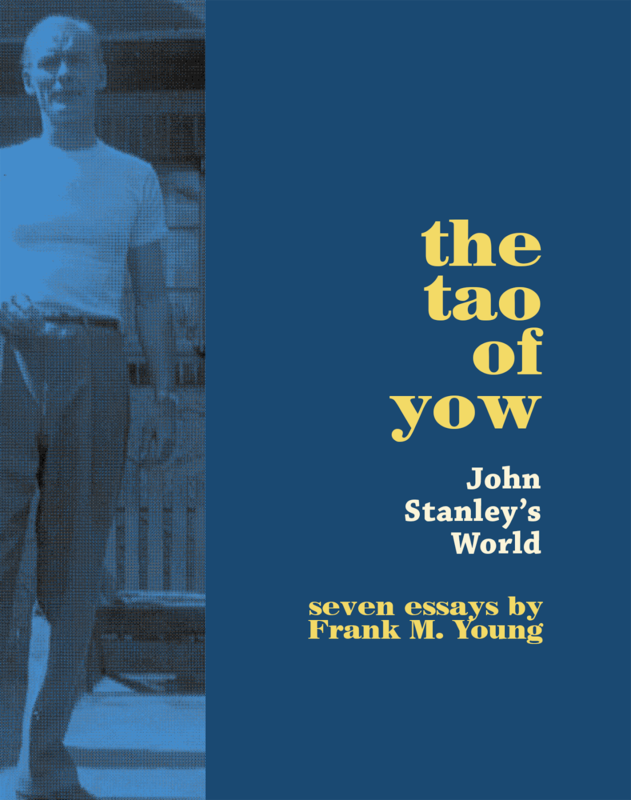 These books are the definitive resource for a study and appreciation of the work of John Stanley. They can be purchased from amazon.com. For the 1940s edition, click HERE. For the 1950s edition, click HERE. For the 1960s edition, click HERE. 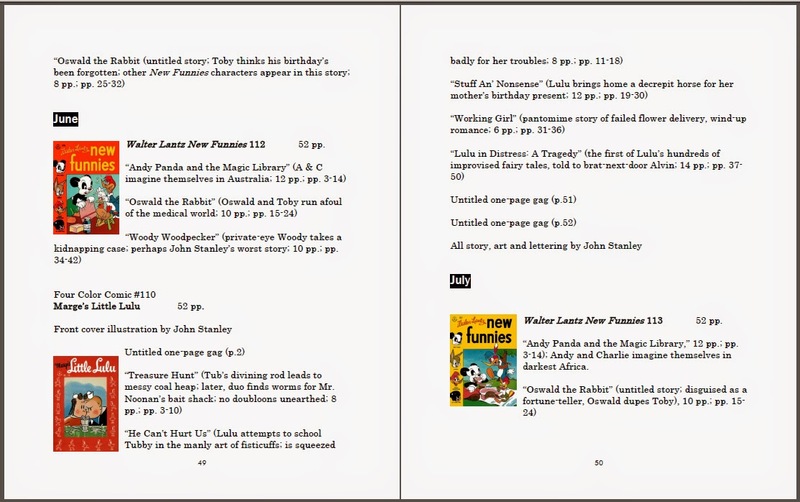 You can look inside all three books on amazon, where they're affordably priced. Take a look! These could make a perfect holiday gift for the comics lover in your life--or for yourself! John Stanley was a great storyteller. His ability to spin multiple variations on a number of stock plots, and bring something fresh to the table each time, is downright enviable. At the core of his storytelling skill is a sardonic, droll sense of humor. 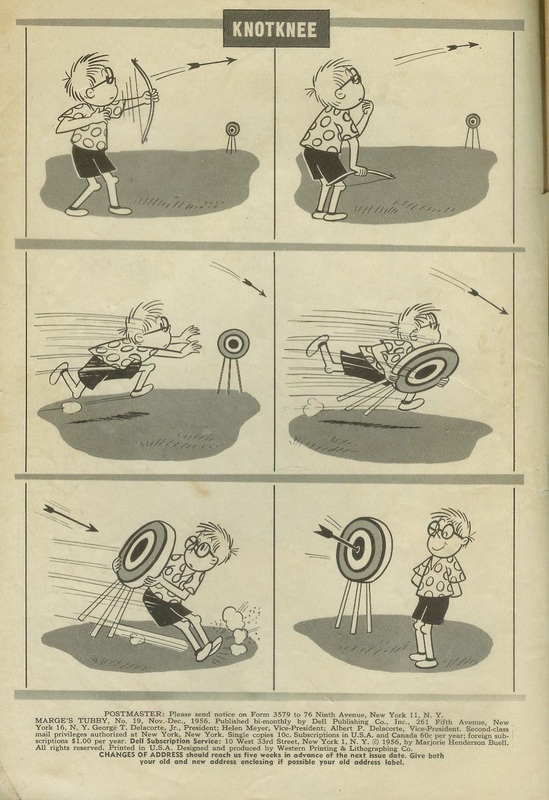 Stanley often indulged in slapstick on the comics page, and did it well. His true gift was an understated, subtle comedy, deeply rooted in the myriad flaws and quirks of characters he made his own and knew like his own children. 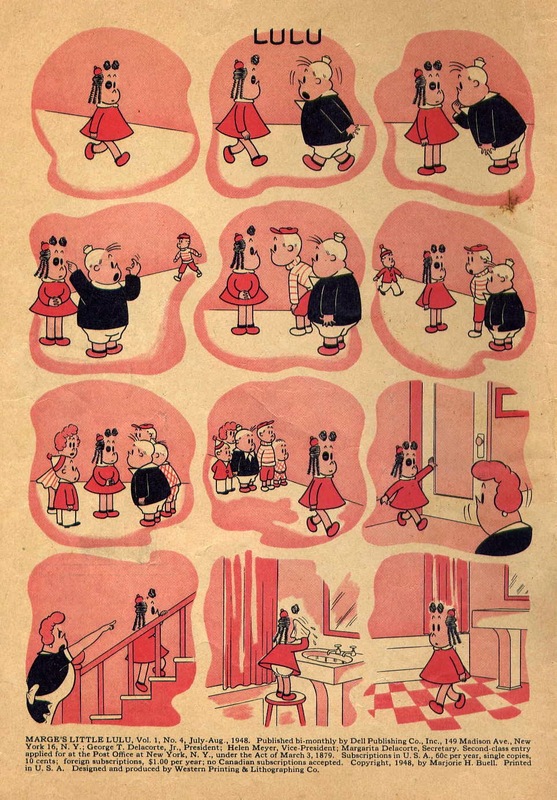 In my recent updating and book publication of the three-part John Stanley Comics Bibliography (see links at foot of post), I've been reminded of the grace and charm of his pantomime one-page gags in early issues of Little Lulu. These were in line with Marge Buell's original vision of the character. They expanded beyond Marge's one-panel chuckles, as did Stanley with all the characters he grandfathered over from the Buell version. 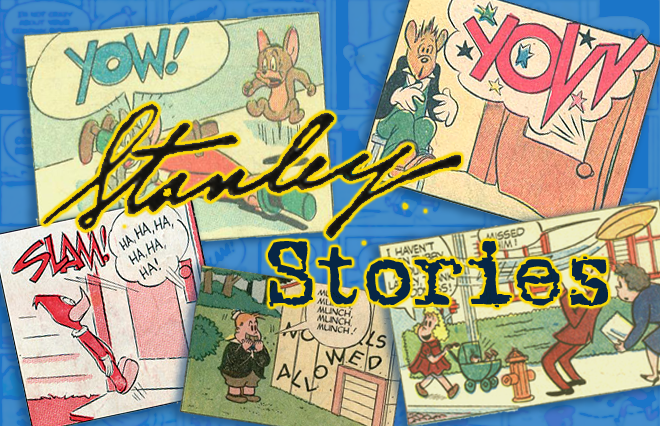 Stanley's "Lulu" and "Tubby" stories are dominated by talk. 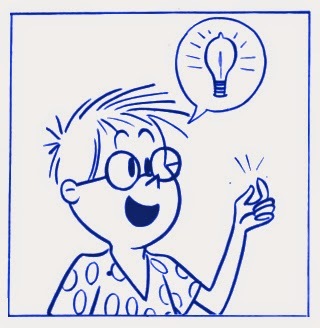 Traditionally, the author offered a great deal of character information from how his comic figures act, react and think. At his best, Stanley can make pages of dialogue riveting. His love of language, and his word-smithing, are evident in each line he wrote for the hundreds of thousands of speech balloons he filled. 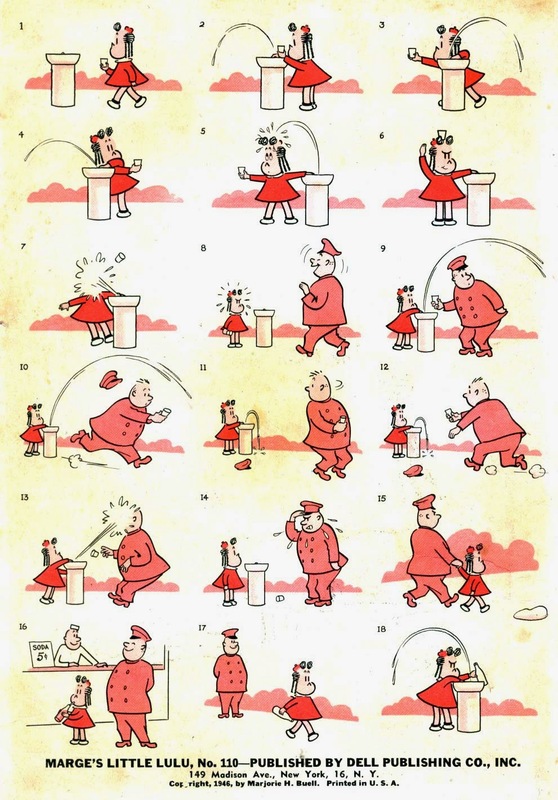 A constant of Stanley's Lulu and Tubby work are one-page pantomime pieces. 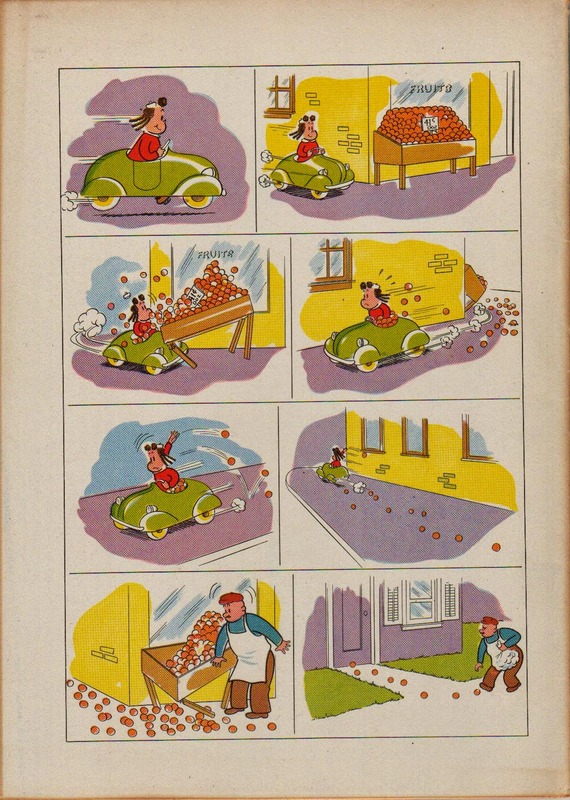 These items, usually landfill in poorly-planned comic magazines, were treated as equals to the longer, dialogue-driven stories by their creator. There is no sense of haste or waste in these pages. As with the text feature, Lulus Diry, these apparent fillers are as rich and rewarding as any other components of the series. 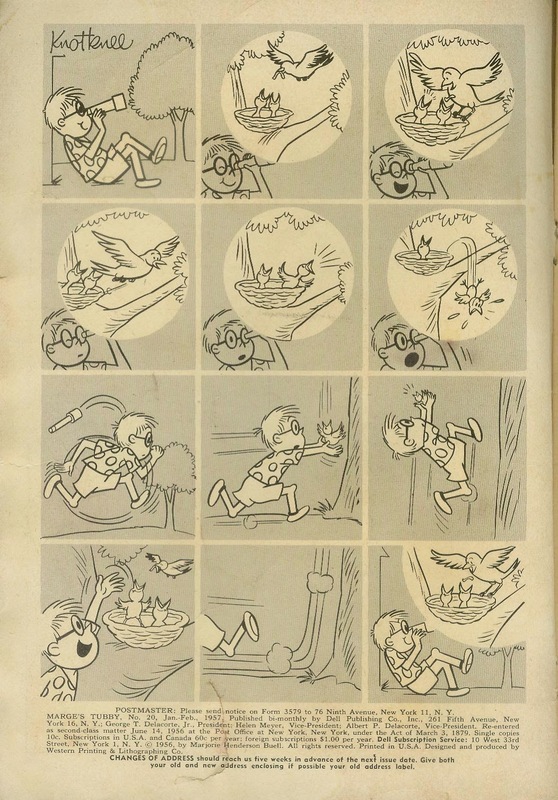 Stanley did another string of impressive one-page pieces for the magazine New Funnies, featuring his rendition of Woody Woodpecker. Those may be read HERE. 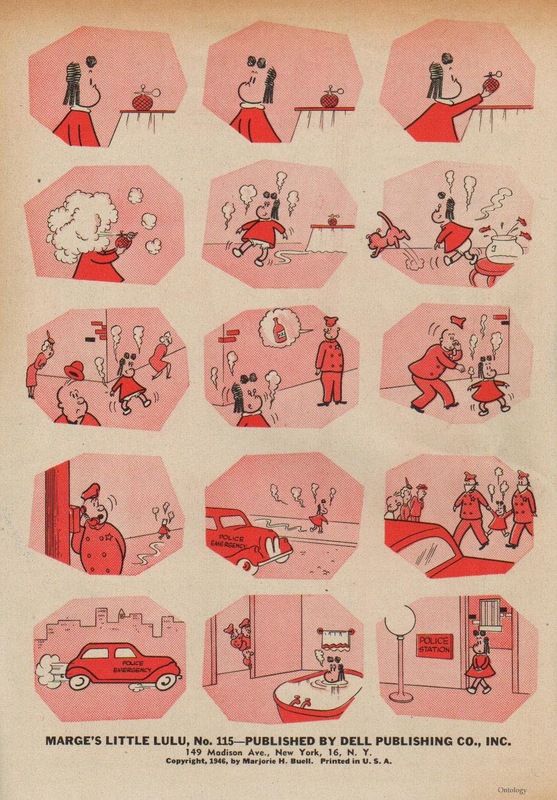 The "Woody" pages, drawn by Stanley, traffic in the typical sassy dialogue exchanges of his longer stories. The Lulu pages are almost exclusively mute, and require the reader's utmost attention to small details. Their rhythm, flow and structure are striking. They're often laugh-out-loud funny, and offer a taste of Stanley's driest wit. John Stanley's hand as cartoonist is keenly felt in the earlier pages. 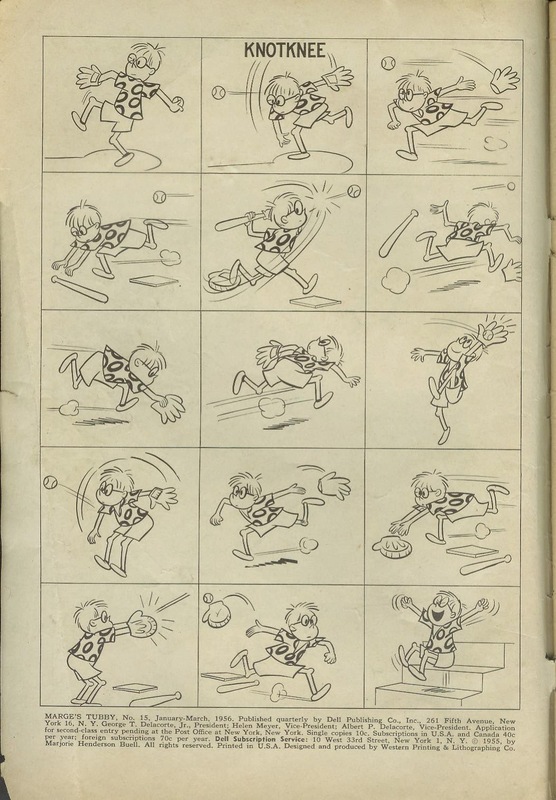 This sheaf of 23 pages offers a quick look at the visual evolution of Lulu, from Stanley's cartooning to Charles Hedinger's to Irving Tripp's. Stanley entertained an ambition to be a magazine gag cartoonist. 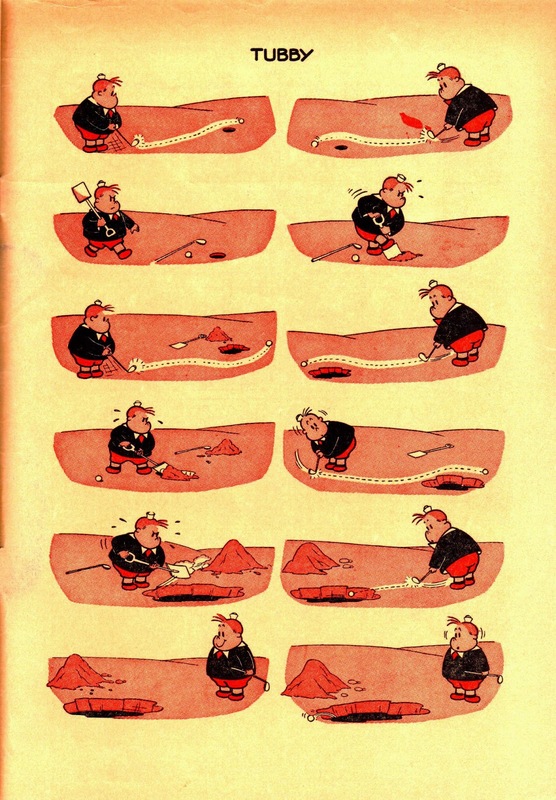 He had one cartoon published in the New Yorker in 1947. 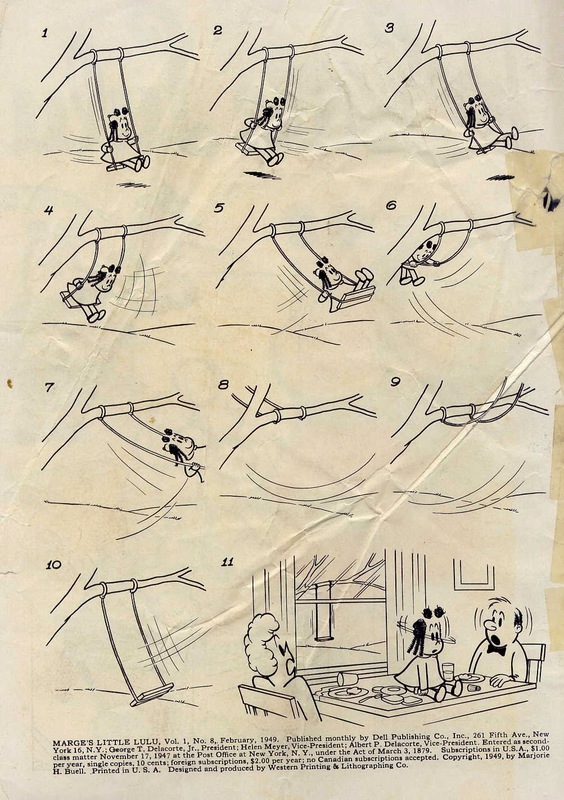 Roughs exist for several other well-executed gag cartoons, but I don't think any others were published in his lifetime. Book Edition of the 1960s John Stanley Bibliography is out! 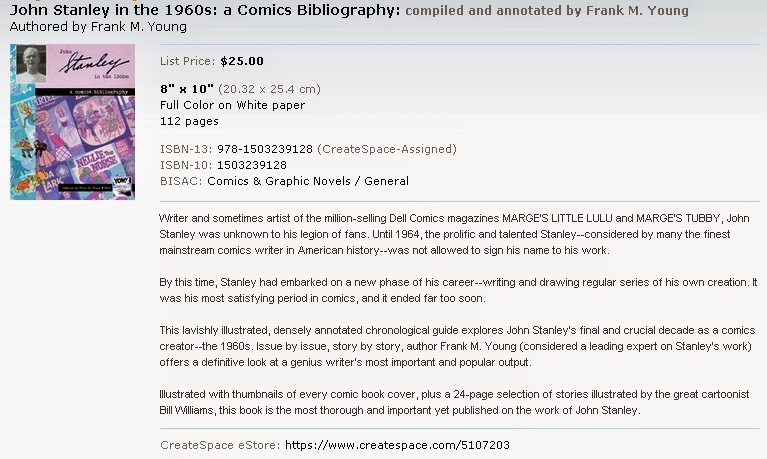 THIS LINK will take you to the CreateSpace store page for this 112-page full color updated edition of the 1960s John Stanley Bibliography. In a few days, it will be available on Amazon, and I'll append this post to include that link. 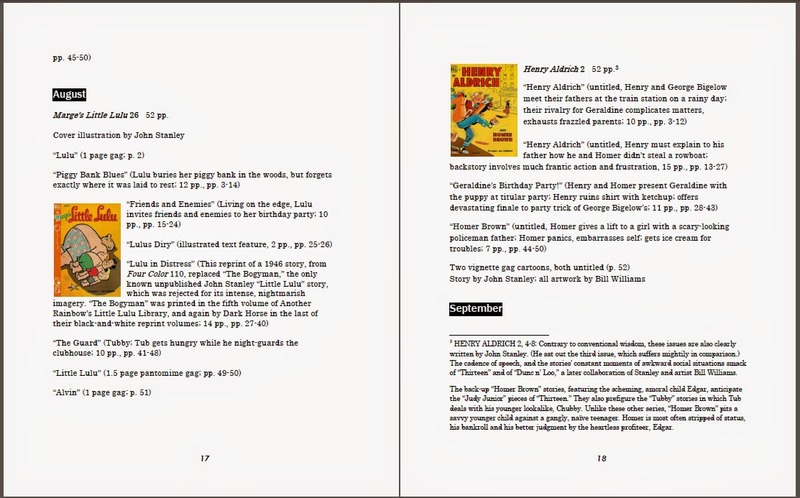 This print edition, in an 8 x 10 trade paperback, is full color, and features a special 24-page section of stories written by Stanley and illustrated by his greatest collaborator, Bill Williams. Any of these three books will make a superb holiday gift for the comics fan in your life. Please consider purchasing one or all of these books. Thank you! 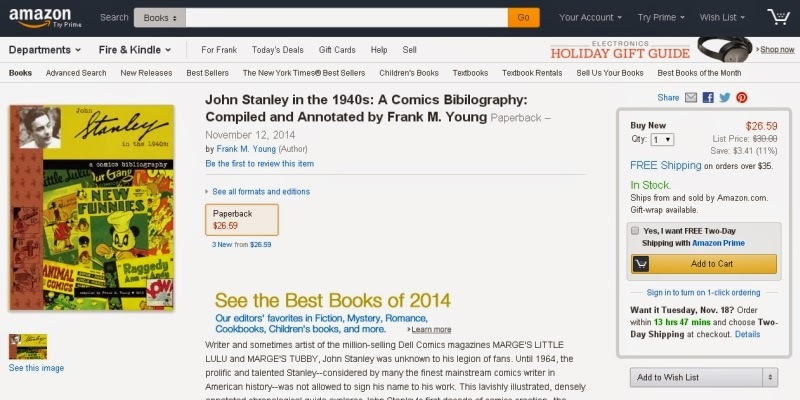 Book Edition of the 1940s John Stanley Bibliography Available on Amazon! THIS LINK will take you to the amazon.com page for the deluxe full-color version of the 1940s John Stanley bibliography. 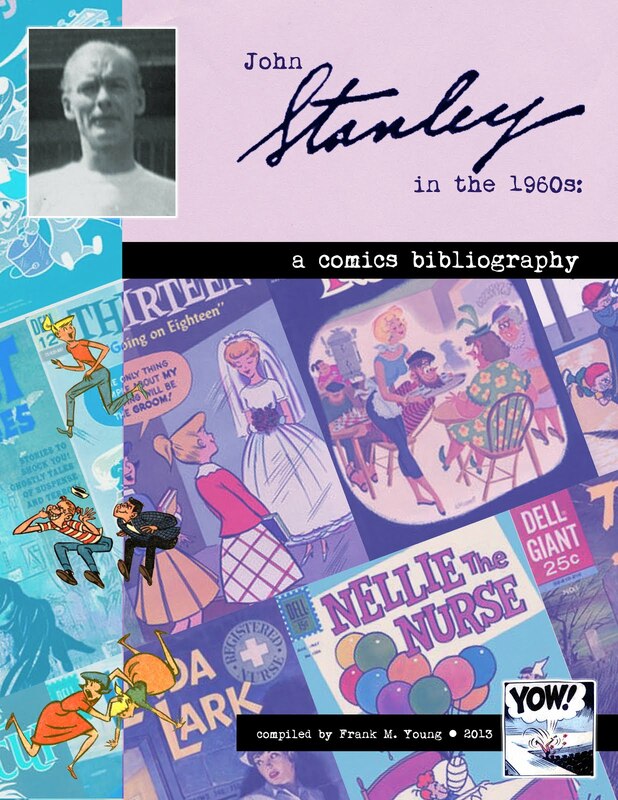 This is much improved from the original download version, with a great deal of new content, three complete comics stories, and seven essays on the significant Stanley characters of this decade. The publication of this and the other two books in the bibliography is the culmination of years of research and hard work. I'm glad to be able to make these available in print form. The John Stanley 1950s Bibliography is now on Amazon! Start spreadin' the nooz! 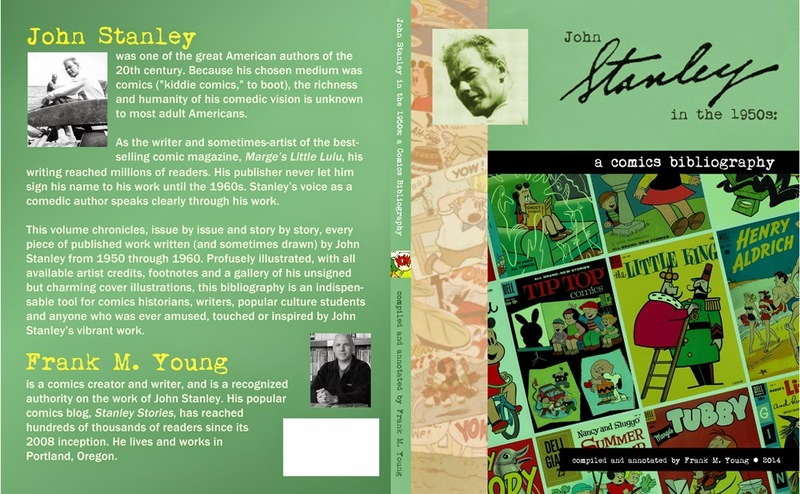 Both the cost-conscious standard edition and the deluxe all-color version of "John Stanley in the 1950s: a Comics Bibliography" are now available for reduced rates on amazon.com! While I get less royalties from the amazon versions, they make the book more affordable, so I'm down with that. Click on those links and check them out! You can look inside the standard edition and see interior pages! 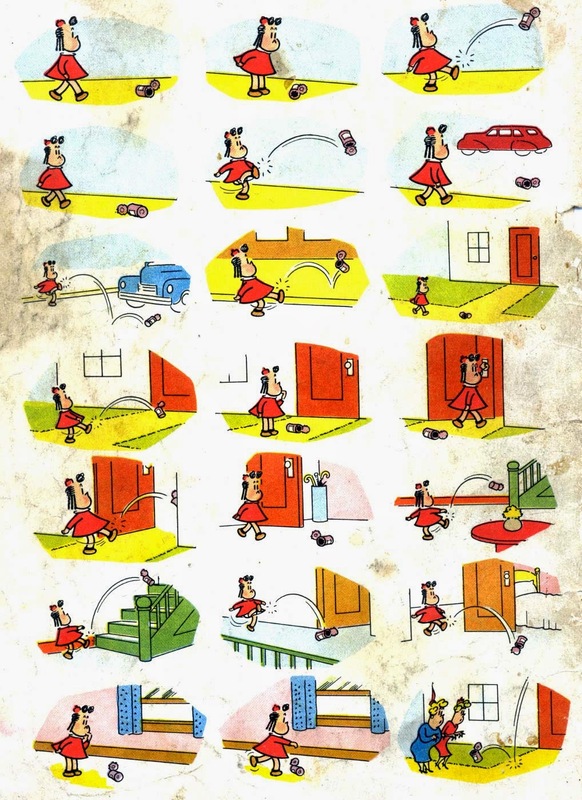 Buy A Print Edition of the 1950s John Stanley Bibilography! Yow! Click HERE to order copies of the standard (black and white interior) edition of the 1950s John Stanley bibilography. It's 190 pages, in a handsome 8 x 10 squarebound trade paperback. The cost is $12.99 plus shipping, from Amazon's CreateSpace. The deluxe (color interior) version, which includes a cover gallery in full color, is also available. THIS is the link for that edition. I have print versions of the other two volumes in process. 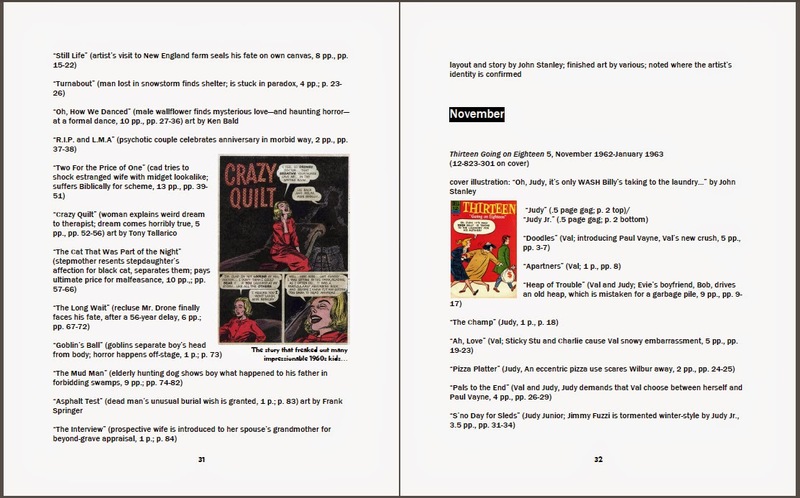 The 1940s volume will undergo some big revisions--mostly the inclusion of more text. Post-Mortem Post 002: The Enigma of "Knotknee"
In doing the research for my upcoming 1950s John Stanley bibliography, I was reminded of a couple of curiosities. Among them is the enigmatic filler feature "Knotknee," which first appeared in the 15th issue of Marge's Tubby. The title already had a secondary feature, "Alvin," which guaranteed its eligibility for special periodical postage rates. 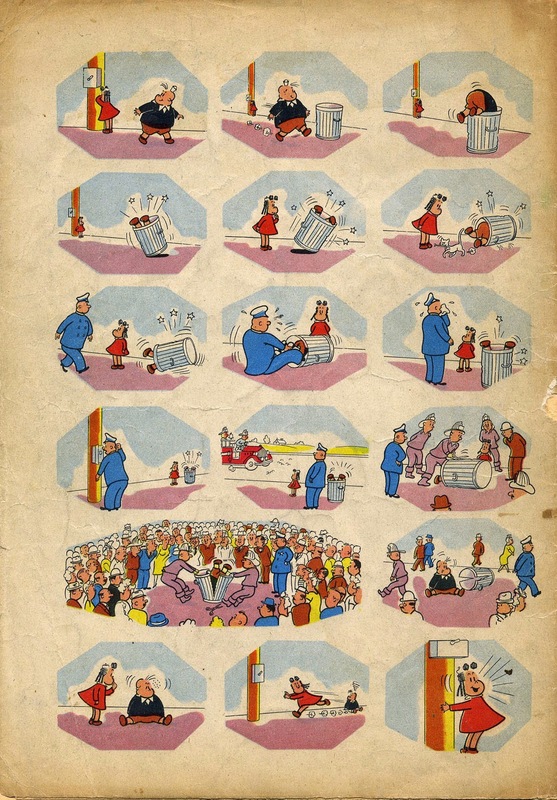 I've made mention of this postal law, which is the reason for filler pieces in 1940s and '50s comic books, elsewhere on this blog. Why "Knotknee" was created is a puzzle. 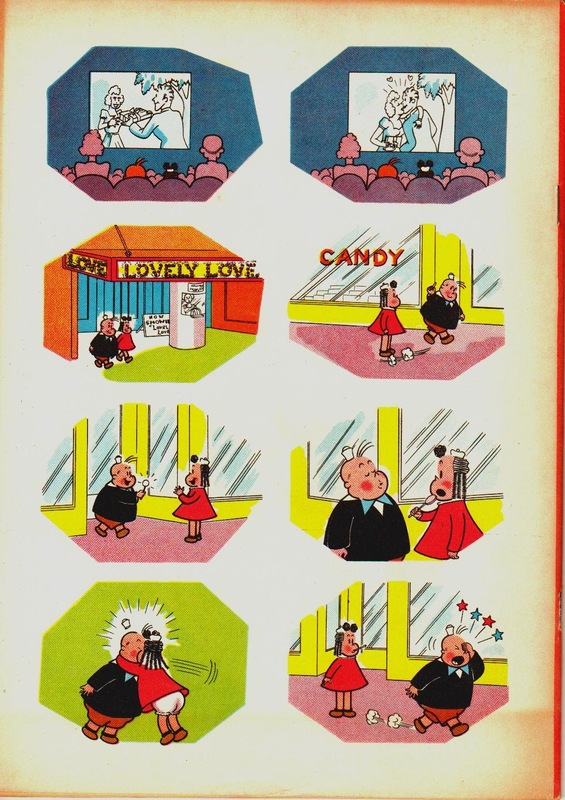 The character does not otherwise appear in any "Tubby" or "Little Lulu" stories. Nor was any attempt made to explicity connect it with those characters. 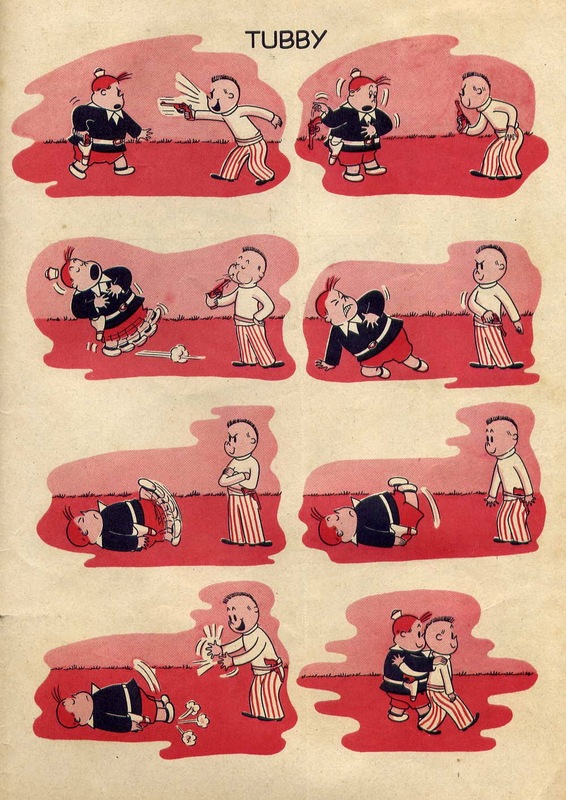 Long before 1956, when this oddity debuted, John Stanley had mastered the art of pantomime comics gags. 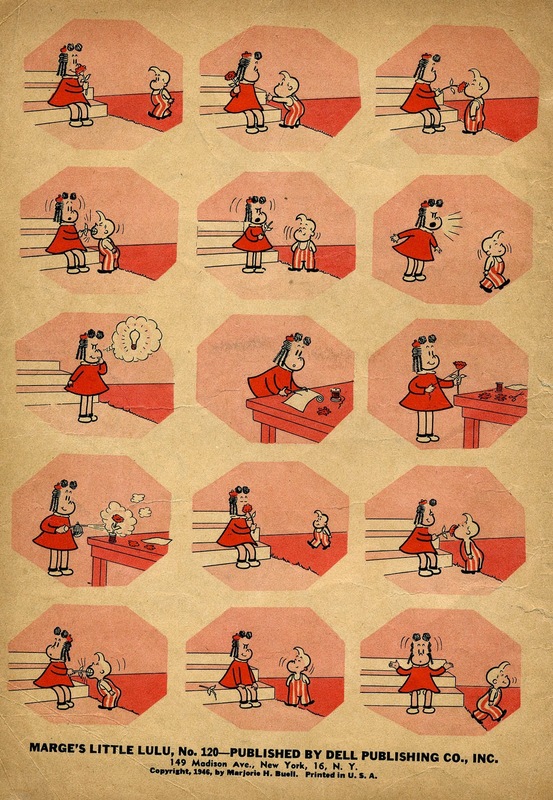 Little Lulu, from its trial start in Dell's "Four Color" series, is rife with such pages. 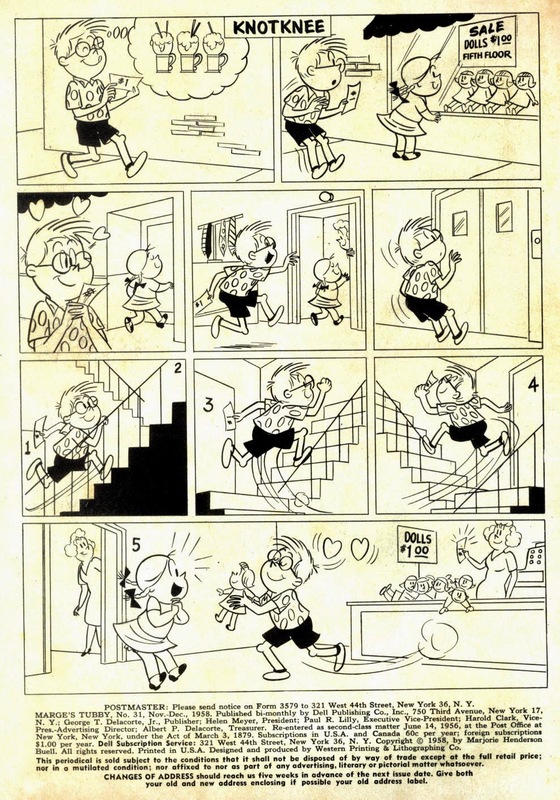 Occasional multi-page pantomime stories appear in Lulu, and in earlier Stanley projects such as New Funnies. For a writer as in love with language as was Stanley, his fluency in using mute images to tell a story is a pleasant surprise. Knotknee's shtick was being very fast on his feet. He was chosen to star in Tubby's one- to two-page text fillers, which are very clearly not written by Stanley. 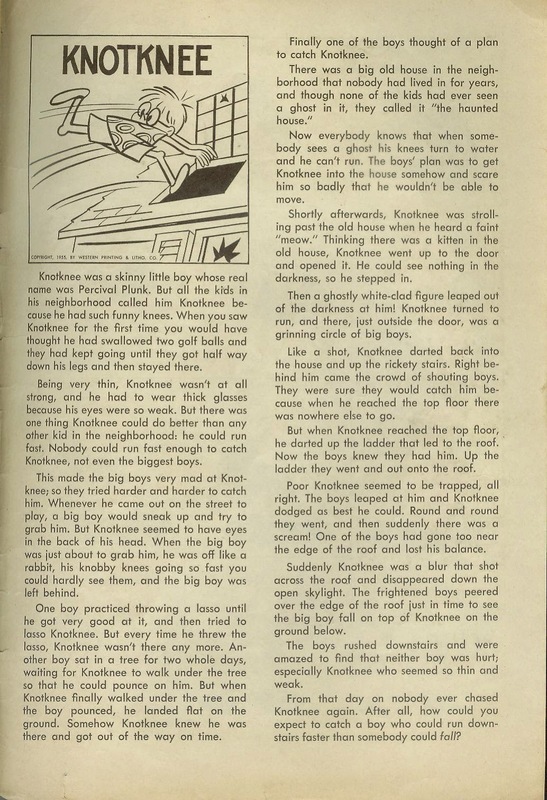 Here is the first text page, from this same issue. This prose, utterly drained of enthusiasm, typifies the 1950s comic book text filler. You can feel the writer's gnashed teeth in every line. 100% independent of the world of Tubby and his clubhouse pals, Knotknee faced similar interests (sports, girls) and fears (bullying, loss of social status). Thus, these pages line up with the other contents of the series, even tho' they seem mutually exclusive. That "Knotknee" is drawn in the Marge Buell style blurs the boundaries further. It might have been jarring to readers to have a filler page drawn in a different look and feel. The feature, as it stands, must have puzzled Tubby fans (those who noticed, that is). Here is a selection of other "Knotknee" pages. 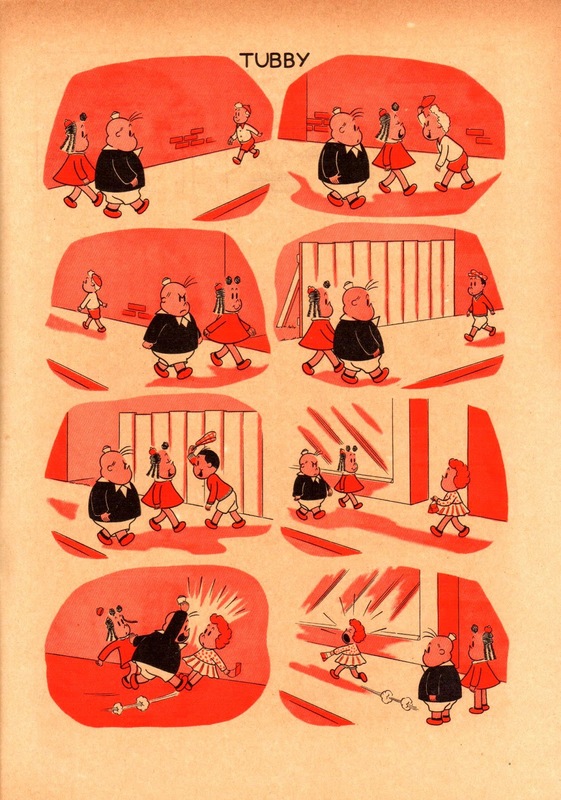 The feature ceased, as a pantomime comic, with Tubby #31, but soldiered on as a text feature. When that Dell Pledge to Parents is wedged into a page, its non-importance is guaranteed. Though a one-note concept, "Knotknee" has some occasional faint charm. 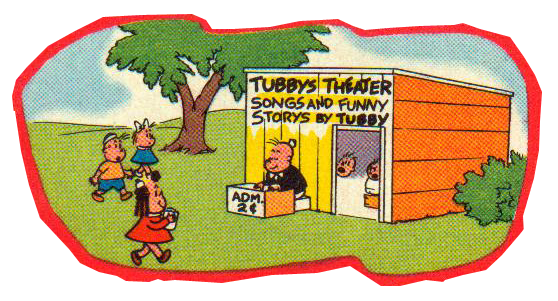 He was never destined to have his own series, or speak beyond the one line given him in Tubby 24. As the most obscure and little-known creation of John Stanley's Lulu-Tubby tenure, "Knotknee" rates a brief mention here. 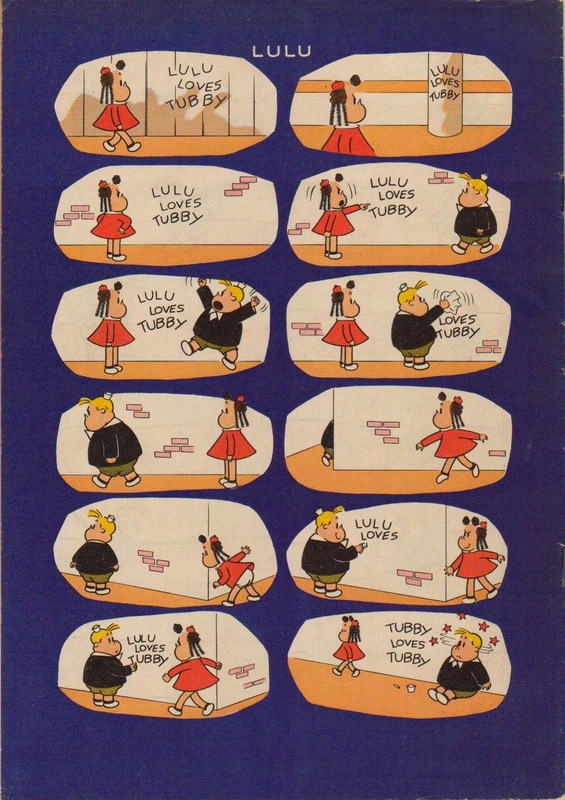 I'm about halfway through the '50s bibliography, slogging through the task of synopsizing each "Little Lulu" and "Tubby" story of the decade (along with all the other stories and series with Stanley's work). I'll be glad when I don't have to type "Witch Hazel" again for awhile. More in this occasional series of post-posts sometime soon. I warned you that I'd come back, from time to time, after "officially" ending this blog. As I make new discoveries, or find new information that either confirms or corrects my past presumptions, this blog will remain on life-support. 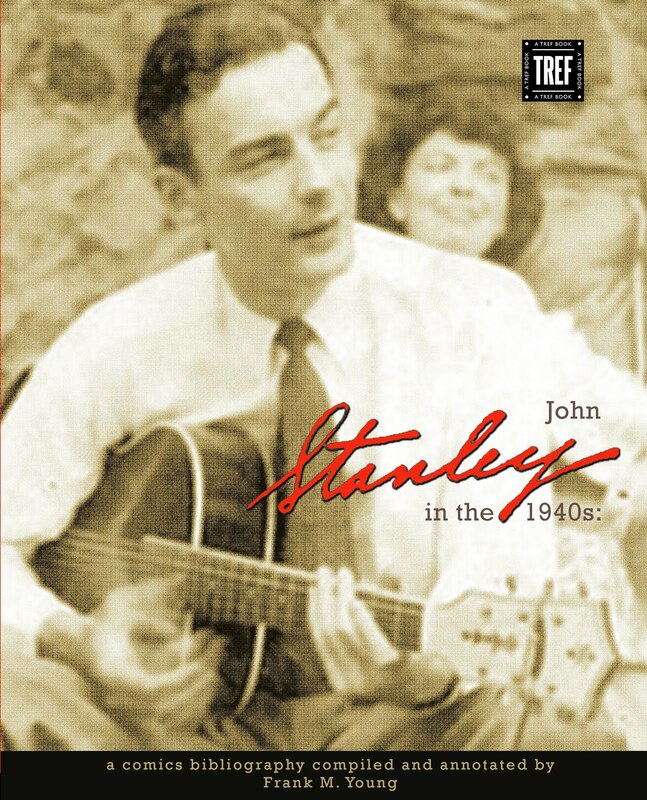 If/when I complete and publish the John Stanley bibliography for the 1950s, it will consist of 11 years of stories. Near the end of that era come two small surprises from a semi-likely source. 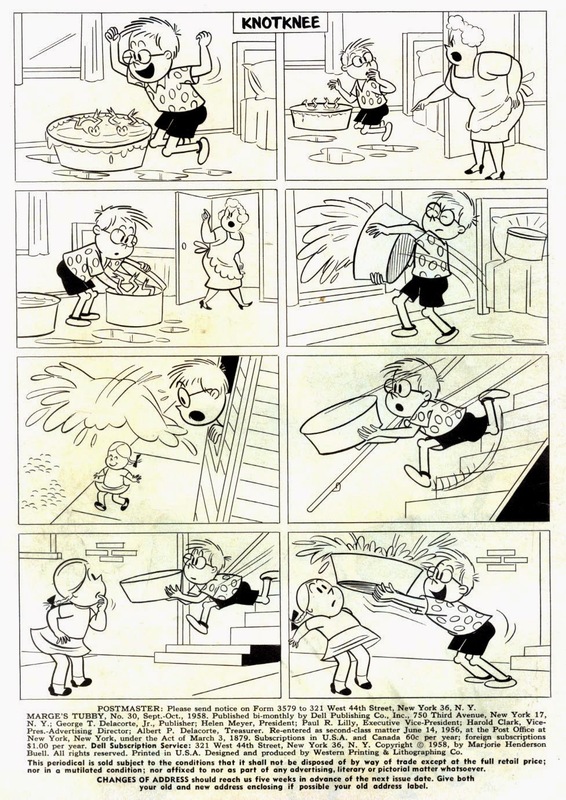 For years, I've suspected that Dell's Peanuts series might hold some John Stanley material. 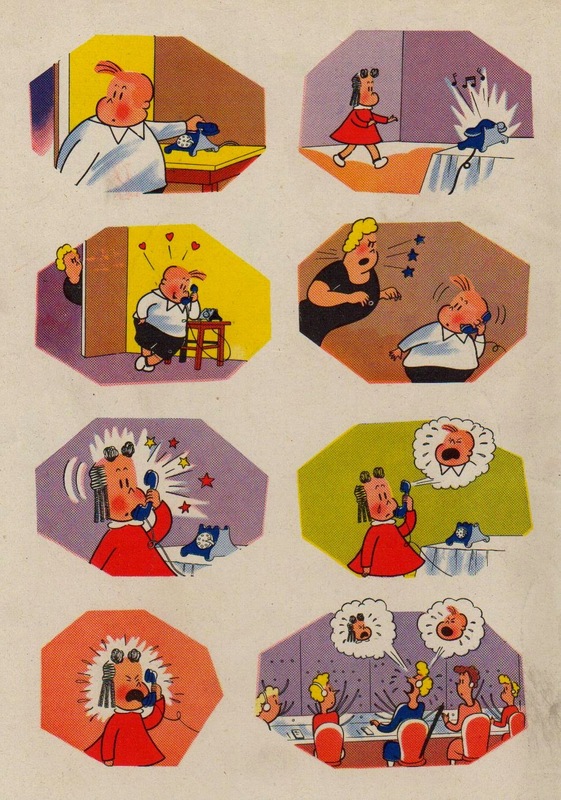 No one had bothered to scan these comics and share them on the web until last month. Said it before, saying it again: kudos to the folks who scan old comics and remove them from obscurity and inaccessibility. Their work is a powerful help for today's comics scholars. 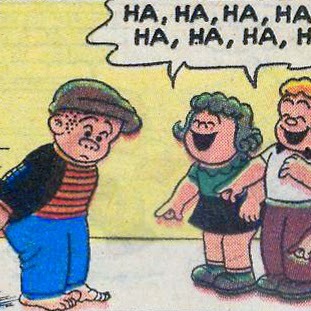 In a just world, Stanley might have been assigned Charles Schulz's characters, rather than the cast of Nancy and Sluggo, in 1959. 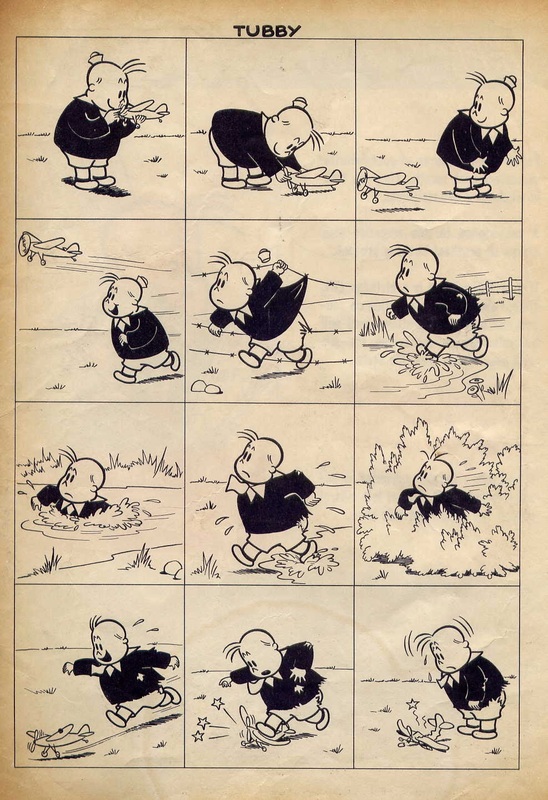 Schulz understandably wished to keep the comic book version close to home. 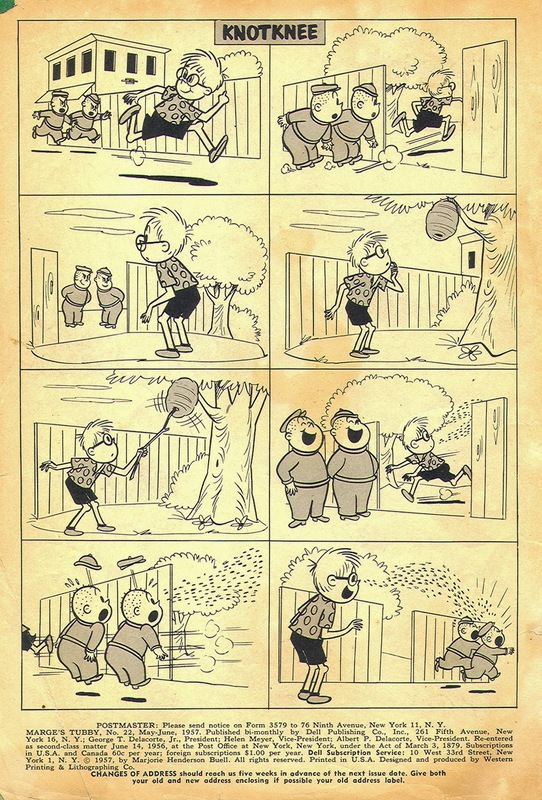 His friends Jim Sasseville and Dale Hale wrote and drew the new material, in the spirit of the mega-popular daily strip. 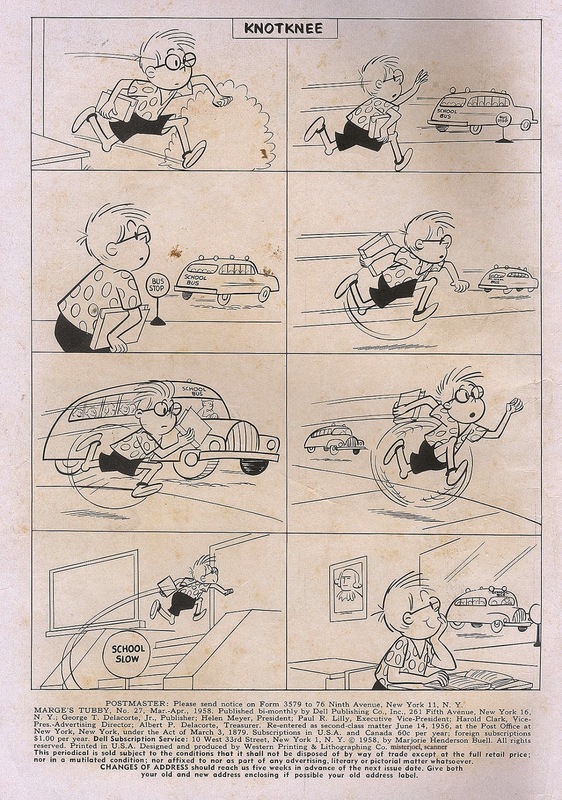 You can read an interview with Dale Hale about his work on the Dell Peanuts title HERE. As has been evident for the last year-plus, this blog is winding down. I've said pretty much all I have to say on John Stanley, short of a larger study, such as a book. But with no visible interest in the publication of a book on Stanley, this blog is the testament of my years of thought and detective work. 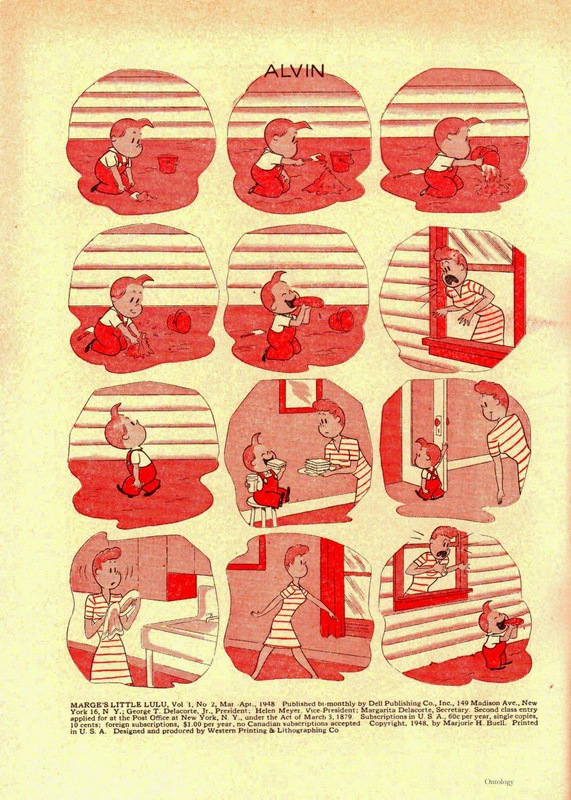 Perhaps Michael Barrier's forthcoming study of the Oskar Lebeck-edited Dell Comics, Funnybooks, will change this apparent apathy. Time will tell. 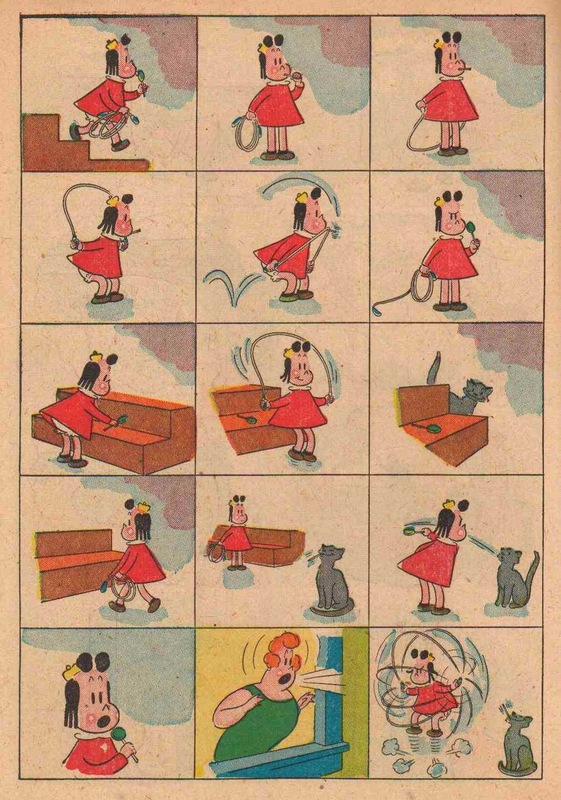 To complete a series on this blog, here are the three stories that comprise the final one-shot Little Lulu comic book (#165 in the Dell Four Color series), with a publication date of October 1947. 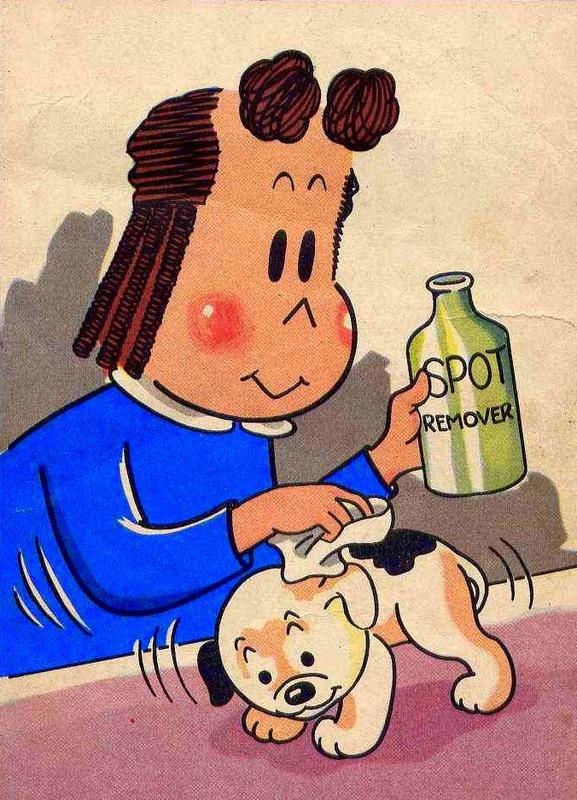 This issue would be followed quickly by the first official bi-monthly edition of Marge's Little Lulu. That short launch time speaks to the popularity of the Lulu one-shots. 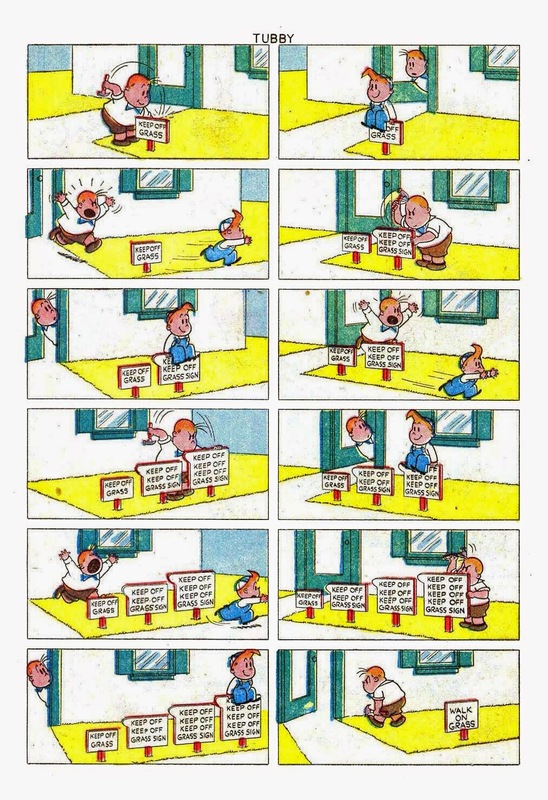 Carl Barks (and other artists) did 25 Donald Duck one-shots before Dell committed to a regular numbered series, four years later. 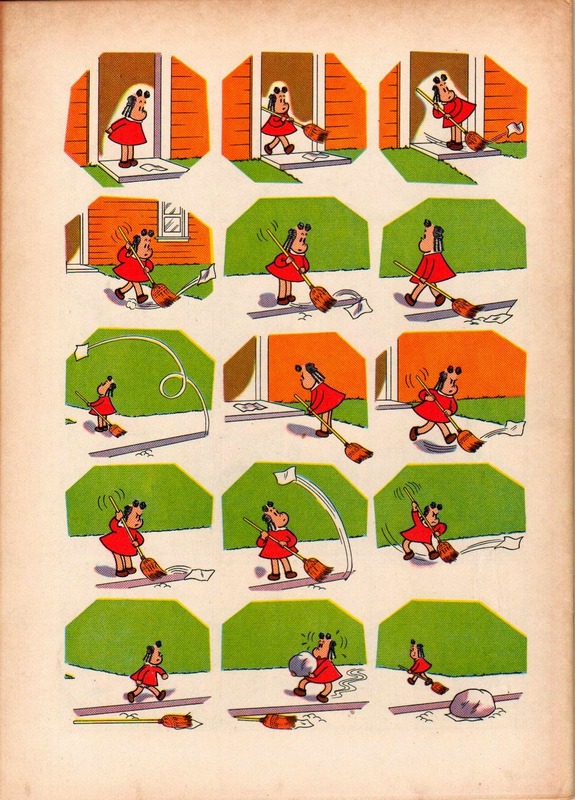 The Disney character was, arguably, a more potent commercial property than Marge Buell's magazine cartoons, but the decisions of publishers, then as now, remain a mystery. Team Lulu is in great shape throughout this last trial issue. Charles Hedinger provides finishes to Stanley's script/pencils. John Stanley's understanding of the character of Tubby comes into sharp focus in the first two stories. All that remains is the entrance of artist Irving Tripp to complete the winning formula. 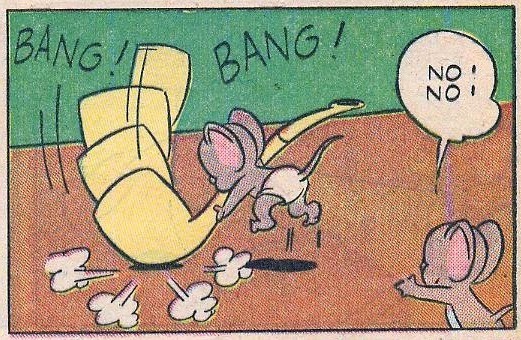 John Stanley's first run on his first regular comic book series, "Tom and Jerry," ended abruptly in early 1946. 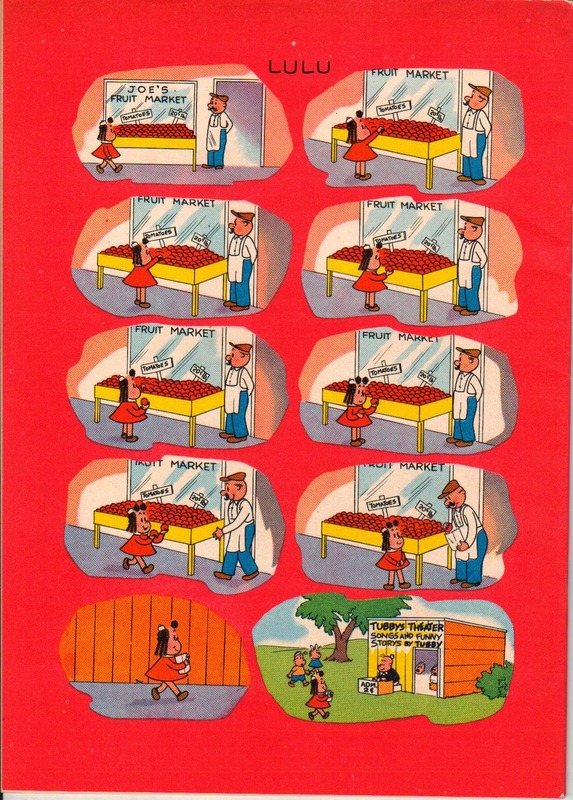 The runaway popularity of his "Little Lulu" comics, still part of Dell's one-shot monthly "Four Color" series, took its toll on Stanley's other comics efforts in this year. 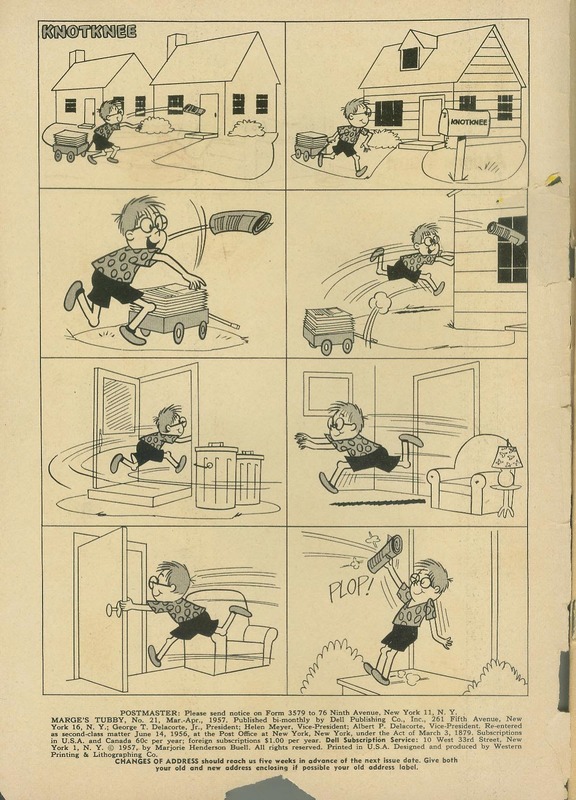 Stanley stuck with his New Funnies features through 1947, as other writers and artists were phased into his shoes. 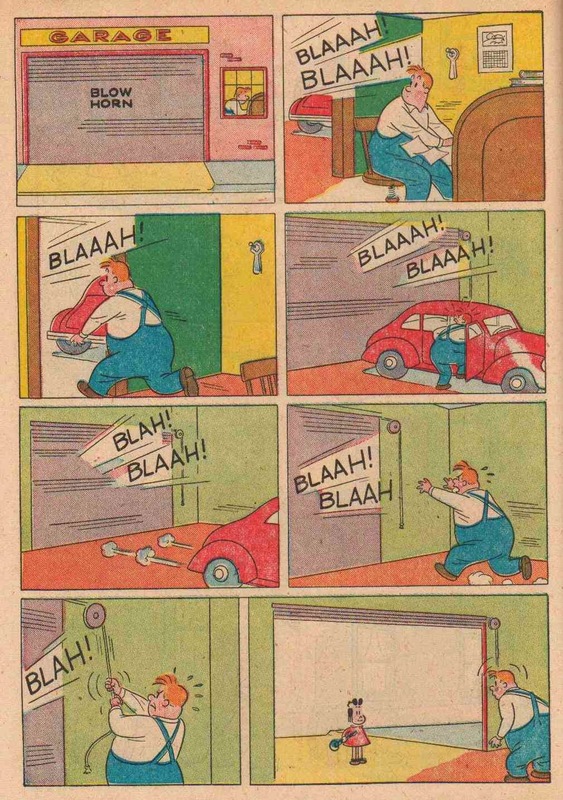 He would return to Our Gang, in 1948, for a brief but brilliant second act that remains one of comics' hidden gems. 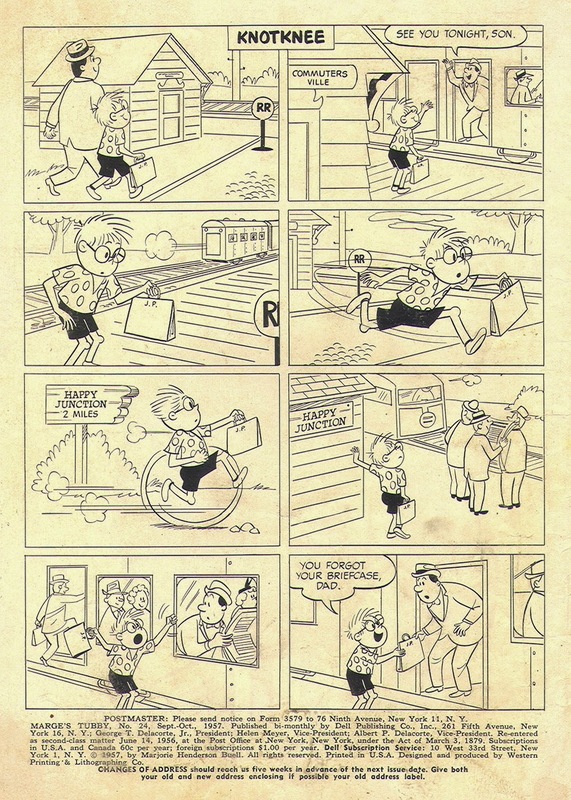 His first departure ended a remarkable trifecta of talent in Dell's Our Gang Comics. 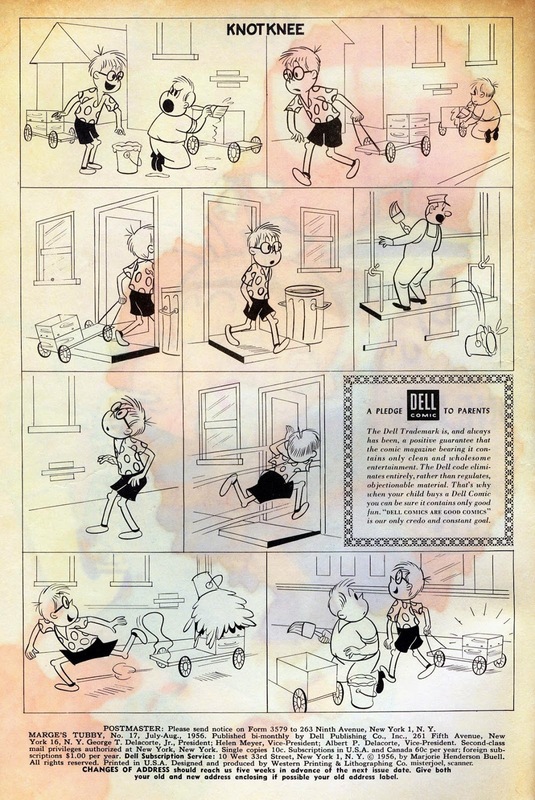 For roughly a dozen issues, lucky wartime comics readers got a knockout combo of Walt Kelly, Carl Barks and John Stanley with their purchase of this ten-cent comic. 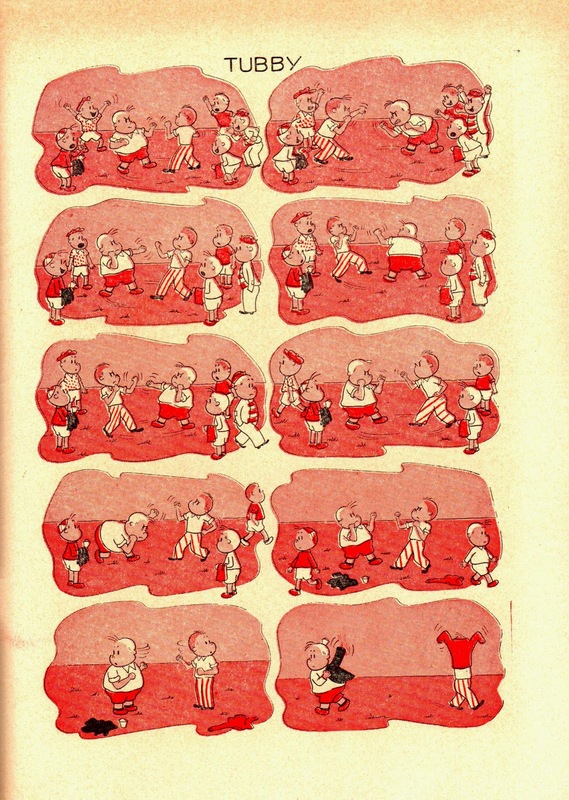 They also got Charles Hedinger's "Flip 'n' Dip," which approached the high level of this work with its sharp drawing and keen knockabout wit. 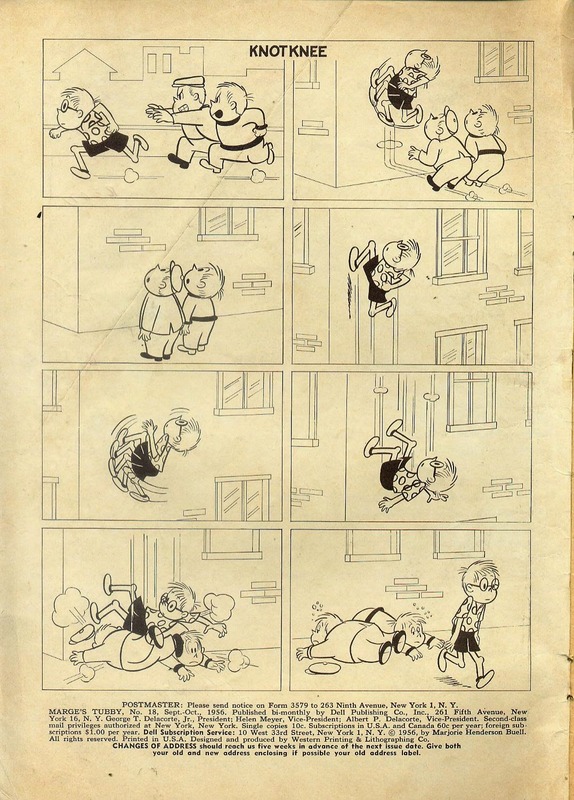 As with Stanley's work for New Funnies, the "Tom and Jerry" stories are a mixed lot. With this post, all of his first run of significant Our Gang stories are available on this blog. Some of them are little masterpieces; others betray late deadlines, disinterest or a bad hangover.